It's hard to believe: The developers stopped work on the editing program Kino  as early as 2009, but it's still in the repositories of current distributions. The application only handles video material in DV formats that amateur cameras used as of the mid-1990s (Figure 4). Figure 4: The veteran Kino is limited to videos in standard definition. The user interface lists all the imported movies on the left-hand side. Played from top to bottom, they represent the finished movie – you can drag and drop to adjust the order. 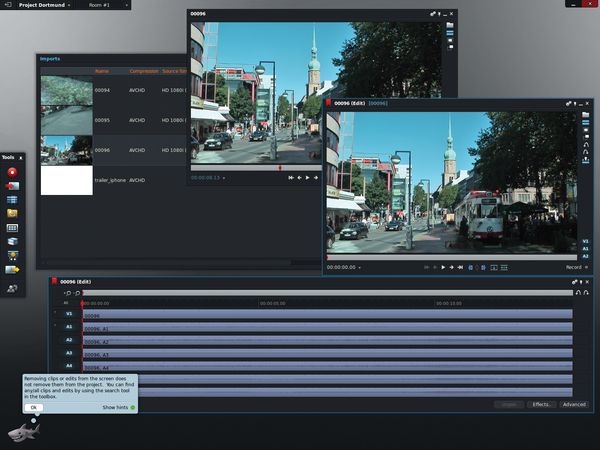 Kino recognizes scene changes when importing a video and automatically dissects the material into appropriate clips. The large preview in the middle shows the whole movie. Kino even offers a shuttle control: The farther you pull it to the right, the faster the preview plays. You can select a processing step using the tabs on the right-hand side, which means you can easily cut the start and end of the movie in the Trim tab and add effects via the FX tab. The options are limited, however: You can only apply one video effect and one crossfade to a clip. 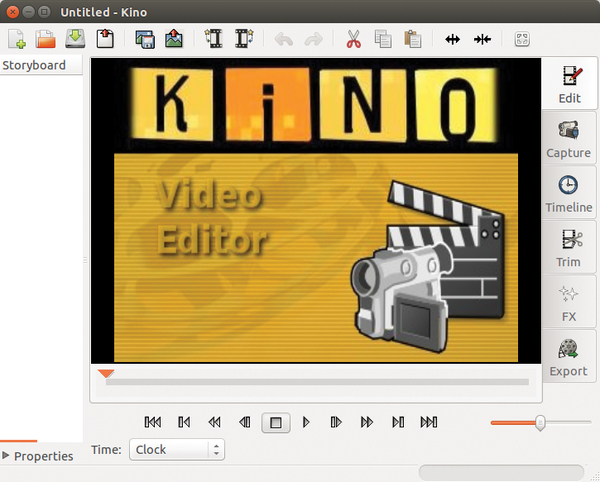 Kino prefers to output the results of your efforts in DV format. It does, however, also produce other formats with corresponding external programs, including MPEG files for a DVD, for example. The commercial editing program Lightworks  was used to produce famous movies like The King's Speech and Pulp Fiction. Since January, Linux users now also have the option of using this professional editing software. The vendor EditShare provides Lightworks in free and commercial variants. Lightworks Free can be downloaded for free but requires you to register with EditShare when launched. This version also only creates videos in MPEG format, and a few features are missing. Support for 3D videos and team functions are included. You can either buy a Lightworks Pro license with the complete scope of features for $437 or rent it for $175 a year. In any case, you have to enable the Pro version over the Internet, which can only be done twice. If you change your computer again then you have to buy a new Lightworks. The manufacturer offers the Linux version as a DEB package for Ubuntu 13.10 and Linux Mint 15 and 16 and as an RPM package for Fedora 18 and 19. Lightworks takes up the whole screen when launched (Figure 5). To enable the features provided by the editing program, you can use the small symbols on the edge of the window, right-click to bring up a context menu, or use keyboard shortcuts. Lightworks Free did not want to read a few popular video formats during the tests, including an AVCHD recording that the other candidates had no problems with. Figure 5: In Lightworks, users are force to juggle numerous windows – even in smaller projects. You can arrange the loaded clips in special storage areas, known as bins, which in turn are sorted into racks. The search function can display all the clips found in a bin. Lightworks opens clips in a separate preview window, in which they can be edited with a few mouse clicks. You then drag the results to a timeline – of which Lightworks manages several – as required. You can nest timelines and put together a movie from multiple sequences. Lightworks has many editing tools that even allow you to move cut points (rolls) retrospectively. Lightworks also impresses with extensive color correction: You can work in the HSV model and fade-in vectorscope and waveform diagrams to check. The effects it includes only cover the basic needs but result in professional quality. As well as the usual suspects like color correction, Lightworks also has splitscreen and bluebox effects. Keyframes change the effects settings over time. A special view makes it possible to interconnect several effects. Each of them appears as a box with inputs and outputs, which you can then connect to each other via virtual wires. If desired, Lightworks will conveniently merge scenes shot with multiple cameras using its Multicam feature. LiVES  mainly targets video jockeys and video artists who produce movies at events. In LiVES, you can thus assign effects on clips to individual keys. During the event, all it takes is a press of the button to run a specific movie or apply an effect. In addition to the keyboard, you can also use joysticks and a MIDI controller to control the program. Additionally, the program can stream clips over the network to other LiVES installations and record the movie that you shoot during an event. More or less as a side effect, LiVES is also a legacy video editing program. 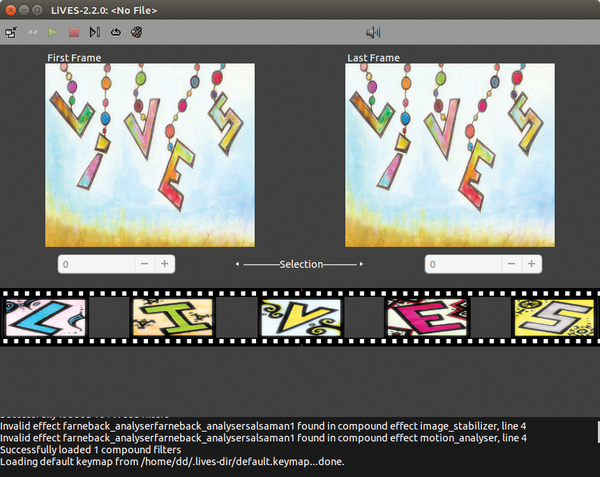 In the clip editor shown in Figure 6, you first cut individual movie clips and then apply effects to them. You can then change to multitrack mode, in which you can arrange all of the prepared clips to create a full-length movie. Figure 6: The user interface in LiVES is extremely cluttered, and controlling the program is complex. LiVES does not just import files from a hard disk; it also digitizes videos from a WebCam or an analog TV card, reads DVDs, or downloads clips from YouTube. However, the editing program converts any video you load in this way into a sequence of PNG images. Although this does let you apply effects more quickly during an event, the video takes up far more space on your hard disk – in fact, you need around 1.6GB for a single minute of video at standard resolution. Playback is controlled by keyboard shortcuts or the appropriate items in the Play menu. You can create a selection by clicking on the timeline to adjust the white bar and define the section you want to edit or remove – precise, per frame editing is thus impossible. Multitrack mode shows a small preview at the top left. To the right, you have all the available facts; also, LiVES shows you a list with the loaded clips. You can arrange the clips in the timeline at the bottom of the window using drag and drop. Crossfades are very difficult to create: After selecting the tracks in question, you define the section in which you want the crossfade to take place. To do so, you then push the gray bar above the timeline. After doing this, you then drag the crossfade effect into the timeline, thus opening a window with various settings. The effects come from the Frei0r collection, which is likely to please the target group thanks to drastic alienation effects such as whirlpools. The title generator looks like the bridge in a spaceship: You use slides to define the length, the position, and the color of the text you want to display. To output the movie you've created, you first need to convert it into a single clip then change back to the clip editor and export it when you get there. The feature scope of LiVES can be expanded using the program's own plugin interface.